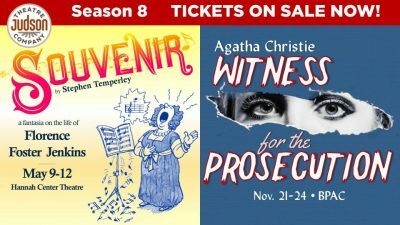 PINEHURST, N.C., Monday, February 11, 2019 –Judson Theatre Company (Daniel Haley, Artistic Director and Morgan Sills, Executive Producer) has announced their Eighth Season: Souvenir: A Fantasia on the Life of Florence Foster Jenkins by Stephen Temperley and Agatha Christie’s Witness for the Prosecution. Souvenir opens Thursday, May 9, 2019 and runs through Sunday, May 12. Witness for the Prosecution opens Thursday, November 21 and runs through Sunday, November 24. After a successful off-Broadway run in 2004, Souvenir opened on Broadway in 2005 starring Judy Kaye, and has been constantly produced in theatres worldwide ever since. Ms. Jenkins’ life story was adapted for the screen in the film Florence Foster Jenkins with Meryl Street and Hugh Grant. Souvenir will be performed at the Hannah Center Theatre at The O’Neal School (3300 Airport Road, Southern Pines, NC). Agatha Christie’s Witness for the Prosecution is the story of Leonard Vole, a young man facing murder charges in the death of a rich older woman, Emily French, whom he has befriended. But he couldn’t have killed her — not if his alibi, that he was home with his wife at the time of the murder, is to be believed. What really happened? Who is telling the truth? This criminally delicious drama of death and deceit keeps the audience guessing till the very last scene. Agatha Christie adapted Witness for the Prosecution for the stage from one of her short stories. The play was a personal favorite of Agatha Christie’s and is considered her theatrical masterpiece. Running for a year and a half on Broadway in the 1950s, it has been an international success for decades, and recently enjoyed a hit revival in London. Witness for the Prosecution is perhaps best known from Billy Wilder’s 1957 film adaptation starring Marlene Dietrich, Tyrone Power, and Charles Laughton. It has been adapted for television multiple times, including the recent 2016 BBC miniseries. Witness for the Prosecution will be performed at Bradshaw Performing Arts Center (formerly Owens Auditorium) on the campus of Sandhills Community College, located at 3395 Airport Road in Pinehurst. To purchase tickets online now to Souvenir or Witness for the Proseuction or request additional information, please visit https://judsontheatre.com/. Tickets for Souvenir will be available to purchase in person at local outlets beginning Monday, April 1. Discounted Group Rates (10+) are available online, or email: JudsonTheatre@gmail.com; Discount Student and Military Rush tickets available at the door (limit 2 per ID). Casting for both shows will be announced at a later date. “After last year’s successful seventh season, we’re thrilled to bring these two terrific plays to the Sandhills.” states Morgan Sills (Executive Producer). “Following our production of Agatha Christie’s And Then There Were None broke our box office and attendance record in 2017, our audience told us we should do more Agatha Christie—and Witness for the Prosecution still packs a punch. Souvenir is sure to delight the Sandhills audience as well.” says JTC’s Artistic Director, Daniel Haley. As Moore County’s only professional theatre, Judson Theatre Company has been bringing the stars to the Sandhills since 2012. JTC is the recipient of the 2016 North Carolina Theatre Conference (NCTC) George A. Parides Professional Theatre Award for Excellence In Professional Theatre for their series of unique productions designed to enrich the cultural fabric of Sandhills and the state of North Carolina. Designated the Professional Theatre Company in Residence at Sandhills Community College, previous JTC productions include Love, Loss, and What I Wore starring Sally Struthers, Kim Coles, and Joyce Reehling; The Sunshine Boys starring two-time Emmy winner Robert Wuhl and tv favorite Don Most; Agatha Christie’s And Then There Were None starring Alison Arngrim; Twelve Angry Men starring two-time Emmy winner John Wesley Shipp (The Flash); Love Letters starring Hollywood icon Tab Hunter and TV favorite Joyce DeWitt (Three’s Company); Driving Miss Daisy starring four-time Emmy winner Michael Learned (The Waltons); and Neil Simon’s Plaza Suite starring Eve Plumb (The Brady Bunch) and Rex Smith (Solid Gold). For more information, visit https://www.judsontheatre.com. 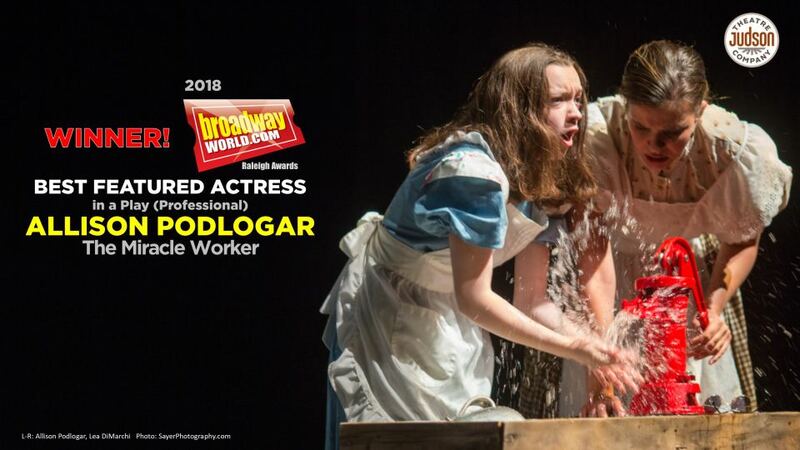 “Helen Keller” in JTC’s spring 2018 production of The Miracle Worker, Allison Podlogar, won the BroadwayWorld Raleigh Award as Best Featured Actress in a Play (Professional). Audiences may also remember she played Scout in JTC’s 2014 production of To Kill a Mockingbird. All of us in the JTC family are so proud of this gifted young actor. Congratulations, Allison!